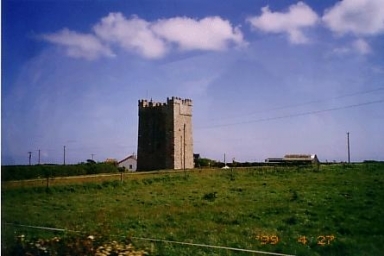 Ballyteigue Castle, rich in memories both grave and gay, is built quite near to the sea at Ballyteigue Burrow. The old keep has always been well preserved and kept roofed by the occupants of the adjoining mansion, and have been many. The castle was originally built by Sir Walter de Whitty, one of the Norman settlers, and the eldest son in succession of whose family, invariably was called Walter. The name was sometimes written Whythay, Whythey or Whyttaye. Richard Whittey was one of the jury at Waterford in 1266. Henry Whythay, the first juror on the Ostmen temp. 1280. Henry Whythey, summoned among the gentlemen of county Wexford to attend the Lord Justice of Ireland with horse and arms. 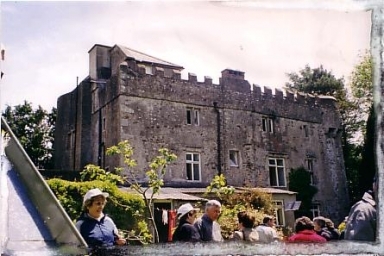 Ballyhealy Castle was a Norman castle built by Sir Richard Whitty and was later the principal residence of the Anglo-Norman Chevers family through the marriage of a Whitty. After the capture of Wexford in October1649, Cromwell led the attack on Ballyhealy Castle, which was destroyed, with the exception of four towers. In 1973 only the one tower remained. This was renovated Nicholas and Maura Whitty. Not interested in family history at this time, they sold it on. Today it is a holiday castle. 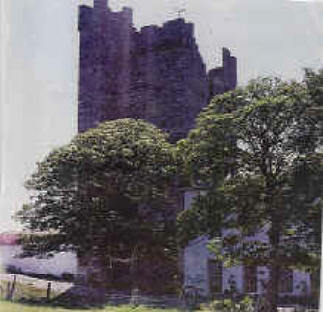 The heirs of John de Villiers held this place in 1307 and from them it passed to a branch of the Whittys of Ballyteigue Castle. According to a plaque on the present building it was originally built in 1330 by Adam Whitty, burned by soldiers in 1798 and restored by Michael Cloney in 1917. An Inquisition dated March 7, 1578 states that Patrick Whitty, late of Kilmacigham, died April 20, 1577, seized in fee of the town of Dungulph and feoffed Walter Devereux of Butlerstown, held of the Queen in capite, Patrick, son of John Whitty, and grandson his heir, of age and married. 1642 – the castle was attacked by a party under the command of Lieut. Treviroe in March 1642, the lieutenant and some 15 of his men being killed, it was defended by Walter Whitty and his brother Adam. Walter Whitty married Margaret, daughter of Edmund Hay of Teucumshane Castle, widow of Piers Fitzhenry. C.S. 1654 – A castle with 330 acres, the inheritance of Walter Whitty. Nicholas Whitty of Dungulph is in the list of those transplanted. 1654 – On April 3, Captain Betts (Bates) was granted the tenancy of this castle. 1667 – the castle was granted to Nicholas Loftus. It then passed to the Cliffe family by the marriage of John Cliffe with Eleanor, daughter of Nicholas Loftus of Fethard. In 1720 it was the seat of John Cliffe. Sir James Ware, writing of the Whitty family states that they lost three fortunes or estates by Cromwell. This castle stands today completely restored after standing for many years as a ruin, (photograph taken when it was a ruin is to be seen in the present building). It then had a conical top to the tower and most windows blocked up. It was restored by the grandfather of the present owner, Cloney family. It now consists of three floors and a round tower which contains a spiral staircase. Kilmore is in the south-east of the Barony of Bargy, which runs parallel with the Barony of Forth to the town of Wexford. Both baronies have been inhabited by the same race, and a peculiar dialect of English was spoken in them not very long since. What is called the Barony of Forth language virtually disappeared about fifty years ago. Here lies Walter Whitty, of Ballyteigue, Esquire, who died 9th November in the year of Lord 1630, and Helen, his wife, daughter of Hammon Stafford, of Ballyconnor Gentleman, who died 27th April, in the year of the Lord 1646, and Catherine, first wife of Richard Whitty, Esquire, daughter of Philip Devereux of Ballymagyr, Esquire, who died 18th of August, in the year 1646, in whose honour the same Richard, the first born of the aforesaid Walter and Helen, with his won second wife, Catherine Eustace, daughter of Oliver Eustace, of Ballymurray, Esquire, cause me (this monument) to be erected, 29th January 1647.